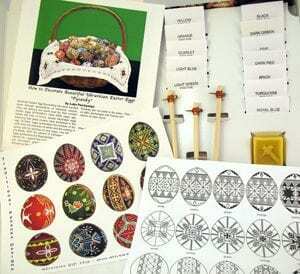 Class participants will learn how to decorate eggs using the batik/wax resist method. 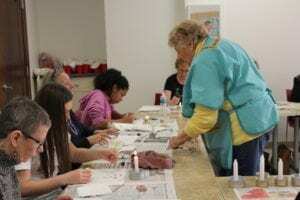 The traditional wax resist process involves several stages of tracing designs with wax and dipping the egg in different colored dyes. Each student will leave with new knowledge and one finished egg. Class size is limited. Pre-registration is required. Ages 8+, Ages 8-11 must be accompanied by an adult. 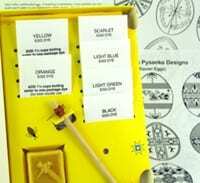 Traditional Starter Kit includes a medium traditional kistka (wax drawing tool), 6 dyes (yellow, orange, scarlet, light blue, light green, black), beeswax, 21 egg designs, and instructions. This kit is normally $18.95 in the Museum Store. By purchasing the kit in advance with your egg decorating class ticket, you will save $3.95! Traditional Deluxe Kit includes three kistkas, or wax drawing tools (fine, medium, and heavy), 12 dyes (yellow, orange, scarlet, light blue, light green, black, dark green, pink, dark red, brick, turquoise, royal blue), a 6 page color instructional folder, and 12 color egg designs. This kit is normally $32.95 in the Museum Store. By purchasing the kit in advance with your egg decorating class ticket, you will save $7.95!